Get Ready For 4/20! 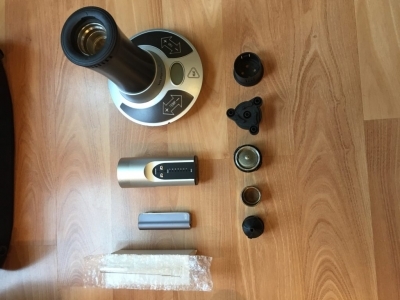 This is the ultimate vape set, including the futuristic, desktop VapirRise Ultimate 2.0, the highly popular and portable Arizer Solo, and finally the CBDfx vape pen as a trusty sidekick for any vape pen enthusiasts. All items are in fantastic condition as they were only lightly used before retiring due to lifestyle changes. 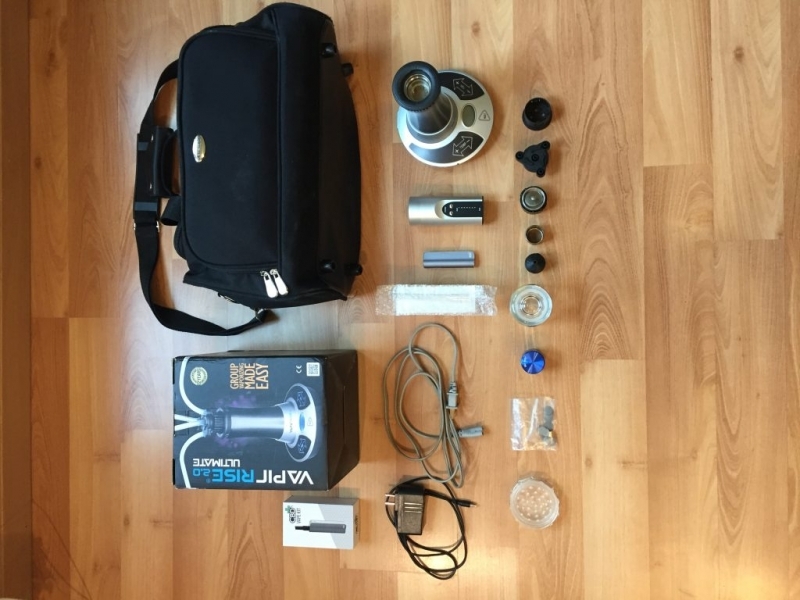 Along with the vape hardware you receive a myriad of accessories, including a glass jar, vape tin, stainless steel screens for the Solo mouthpiece, a Brand New Solo Mouthpiece, charging cables, unused grinder, original boxes of both the VapirRise and CBDfx vapes, and finally a Pierre Cardin bag to keep your tools in one place. See the description below for more information on each vape. YouTube is a great resource to watch these vapes in action, and you will be stunned at how much fun they will add to your vaping experience both in private and party atmospheres. As these were all purchased brand new, the total cost for the vapes came to $385 (not including the accessories). But now it’s time to pass it on to the next vapestronaut, so join the club to experience vaping in all its different forms! Thanks for looking and Happy 4/20! VapirRise Ultimate 2.0 -This is the granddaddy of the vapes, with its multiple uses and ability to drop jaws when introduced at any party. There are 2 main modes, bag and hookah. The bag mode works exactly like a Volcano, but the hookah mode is what steals the show. 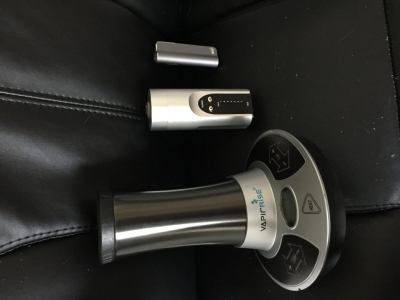 Up to 4 users can connect hoses to the vape and simultaneously enjoy up to a gram of herb. Almost everyone who experiences this mode is blown away at how futuristically cool it is, and often call it the Tesla of Vapes. This retails brand new for $230 USD. Arizer Solo -By far one of the most sought after portable vapes to date, and for good reason. The build quality is excellent, the glass piece heightens the vaping experience, and maintenance is without a doubt one of the easiest on the market even today. Read any comparison online and you will find this original Solo model constantly being thrown in with newer portable vapes, as it is a highly reliable and easy to use, especially for the price. This is the go to as your ‘daily driver’ because of its excellent portability, charging capacity, and easier-than-pie 2 step cleaning process. This retails brand new for $130 USD. 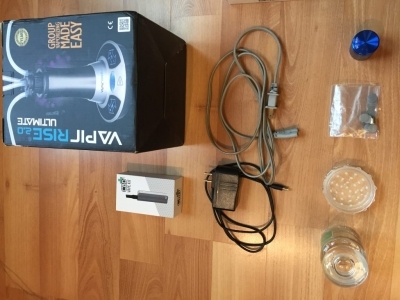 CBDfx Vape Pen -With vape juice becoming wildly popular, the CBDfx Vape Pen allows you to enjoy the wide variety of options on the market today. Universally compatible with all cartridges, you have the freedom to try them all. Charges to a full charge in 30 min via a Micro-USB cable. This retails brand new for $25.